After several months in the works, CZ-USA will now be making P-10 pistols right in the heart of the U.S., Kansas City. They’re also expanding the series with subcompact and full-size models. The P-10 is CZ’s latest polymer-framed,striker-fired service pistol. While the original P-10 was itself a modern design with good features, the American-made models will have even more features along with some improvements. In addition to the changes – based on user feedback – CZ is rolling out “optics ready” models in all three sizes. These guns have slides with factory cutouts for mini red dot sights. Like the original P-10 these are all chambered for 9mm Luger. The standard compact C model has the same 15+1-round capacity and a 4-inch barrel. The new sub-compact S has a short grip with a 12+1 capacity and 3.5-inch barrel and the full-size F holds 19+1 rounds and has a 4.5-inch barrel. CZ offers them with 10-round magazines as well, and also has +2 baseplates for standard-capacity magazines. The different configurations let people select a model that best suits their needs. The full-size is suitable for self-defense and competition, the sub-compact is sized for concealed-carry, and the compact is a good all-purpose handgun. The pistols have an orange dot front night sight with a Tritium lamp and serrated black rear sights. They ship with a blank optics plate with Trijicon RMR and Leupold DeltaPoint plates available separately. CZ also has suppressor-height sights for shooters who want to co-witness their red dots with their irons. The main change is to the magazine release. While the original P-10 had ambidextrous release buttons, many shooters said they had problems using it. The redesigned button is easier to depress, and while it’s not ambidextrous, it is reversible. 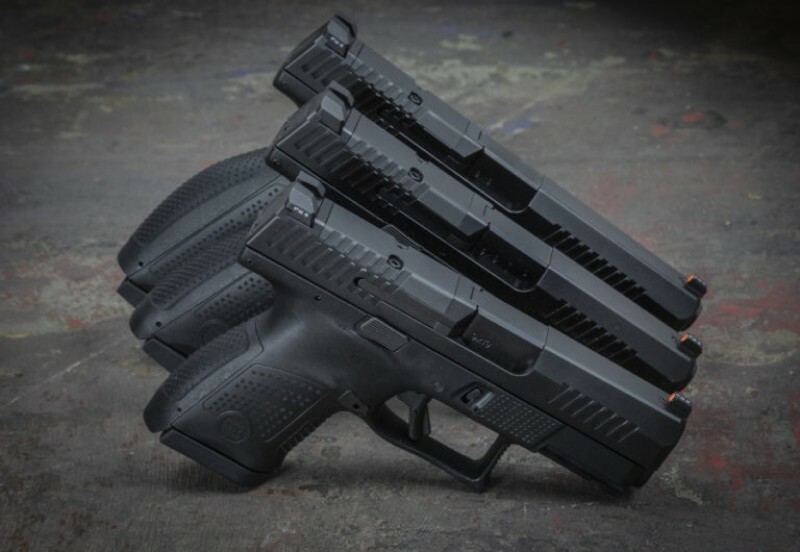 Both American-made and Czech-made P-10 pistols are getting the new magazine button. The slide release levers are still ambidextrous. 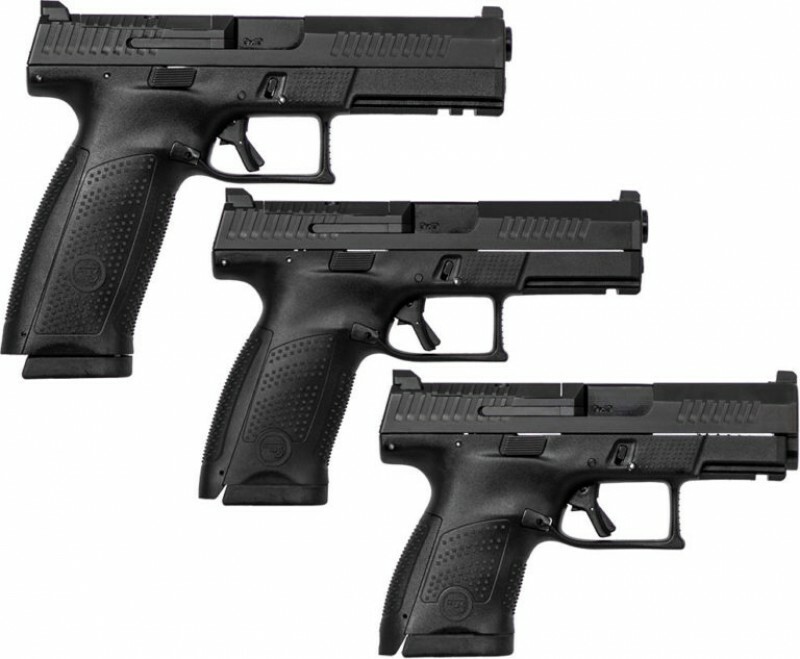 The rest of the features that made the P-10 an instant success for CZ are all still here. The new models have contoured, ergonomic grips with interchangeable backstraps, passive trigger safeties and short, crisp trigger-pulls. MSRP for the new guns runs between $577 and $590 which is pretty competitive. CZ is in a position to undercut a lot of other optics-ready pistols on the market with their pricing. With these new models it’s clear that the P-10 isn’t a one-off for the company. CZ is now firmly dedicated to the striker-fired service pistol and we expect more models and variants to follow.